I recently had a conversation with a University of Virginia media student about the future of journalism and falls on the heels of a webinar I did recently with journalism students at the Missouri School of Journalism. My advice to those students and to those entering our field is, and always has been, decidedly optimistic. Media and publishing is still a great career. It's not like it was, but perhaps, now it is something more, something bigger and very global. My optimism may be hard to understand with all the data that on the surface seems so damned negative, at least for the print side of publishing. To be truthful, most of the data is negative for print magazines, but not for every magazine. And that is what must be fully understood and why there can still be a robust future in store for some of those who choose the print path to revenue and glory. When the new media transformation period is over and we finally reach a period of "communication normality", the print publishing part of the media business will still generate multiple billions of dollars. It's that simple and, oh yes, complex too. Your mission, if you wish to stay in print, is to achieve and maintain such a high level of excellence as to sustain your products' survival as an analog medium in a digital world. It is a difficult but not impossible goal to achieve, but not without some drama and angst. The drama and angst manifests itself with the rise of digital media platforms that usurp the public's time from print to other forms of information distribution. In this second chart (below) you can clearly see the trend line from 2011 to 2013 for the print portions of Mary's reports. Each year print loses a few percentage points. There is no reason to think that 2014 and 2015 will be any different. Now we get to the latest newsstand and circulation numbers where the newsstand fell 14.2% and subscriptions fell 2%. Those new numbers substantiate much of the trend data shown above. Next we get to the continued release of information by some industry observers that there are more magazines now ever before. That is indeed true, but vast quantity is not an indication of an industries vibrancy. The true scoring system is in sales. The fact is, is that it is not the quantity of the magazines we produce, but rather the amount of copies that we sell that puts food on the table and pays for our mortgages and continuity. 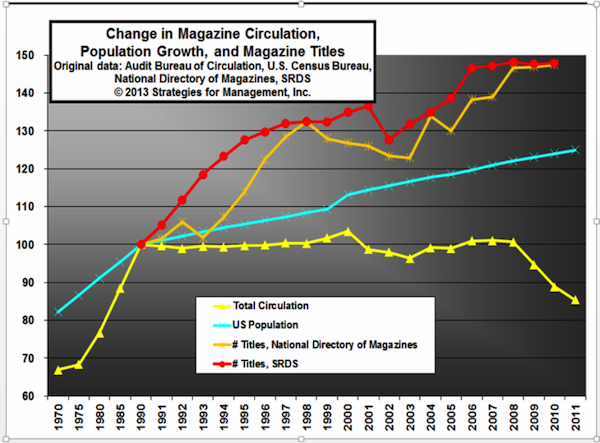 The chart below by Dr. Joe Webb, demonstrates the relevance of the number of titles produced compared to both the population and circulation trends. 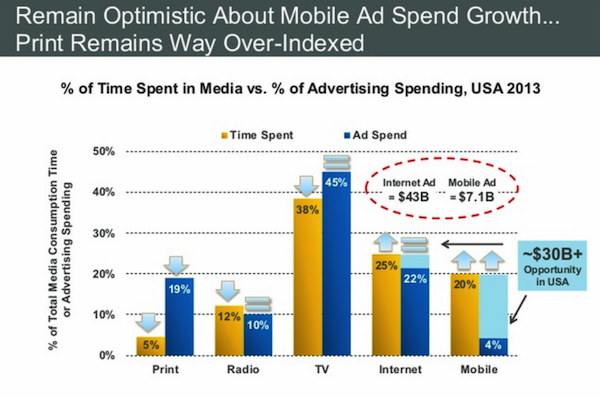 As you can see, producing more titles doesn't mean we sell more magazines and one of the reasons for that is that the reading public is spending less time with print and more time on their cell phones and other mobile data devices. With all this negative data, and lets face it ain't pretty, I still believe that printed magazines aren't dead or dying. In the end we will have a much smaller footprint in the media landscape, but we will finally reach a coveted and redefined level of producing a luxury product instead of a commodity. In this day and age why would we wish to put anything in print if it wasn't worth the expense? We are and will be increasingly selling fewer print products as an industry, but that isn't necessarily death, nor is it dying. In truth we are as an industry moving on with other lucrative communication tools, and we are successfully creating new and varied alternative revenue streams. These new extensive communication tools will be a much larger slice of the revenue pie and of greater value in total than our old and still beloved-by-many printed products. 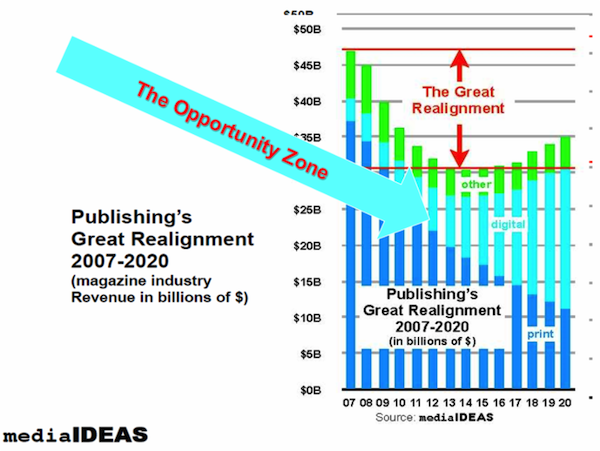 In 2007 my company MediaIdeas predicted that by 2020 digital revenue for publishers would be 60% of the revenue stream and print would be 40%. Here we are in 2015 and at the recent AMMC conference in January, the Meredith CEO Steve Lacy said their revenue is 30% digital and rising. Several industry analysts suggest that Hearst is at or around 20% and rising. The reason for my continued optimism for my printer friends and publishers is that although I believe my forecast for print revenue is accurate, it still leaves somewhere between 12 and 15 billion dollars to be shared in 2020 by that part of the industry that chooses to remain in the analog world. That number is not small change and quite lucrative enough to support many a printer and business that wishes to manufacture luxury printed reading materials. Take the formula out another ten years from now in 2025? I feel confident to suggest that that same trend will continue and that the numbers will be something like 80% digital revenue and 20% print. That 20% print number will still be a figure in the billions, although far from print's heyday of 37 Billion in 2007. All the charts and trends are happening right now and will continue to happen far into the foreseeable future. Although newsstand numbers continue to be abysmal with a staggering loss of somewhere over 55% in the last 6 years, and subscriptions down double digit points in the same time frame, many print publishers are doing quite well, and some are making more money than ever before. What I share with the students and what I say here, is that it could be you and your company who survives the current print drama and angst, for assuredly, if you and your company stay with print as the main product, it is possible to be part of the billions that will be left in the field. As I recently said before, "the trick will be to stay smart, agile and very demanding - demanding of your staff and co-workers, as only the very best can and will survive." THE KEY POINT IS "It doesn't matter what the trends of the overall industry are to individual companies, so long as you can continuously produce unsurpassed editorial excellence in your particular niche, regardless of format. The key for both the printers and the publishers will be producing an extremely high quality product that is worth the price you will clearly need to charge to produce such a superior print magazine."